Ebondo possible replacement for Akhuetie in FIBA Asia Championship Cup 2017 - Balita Boss! 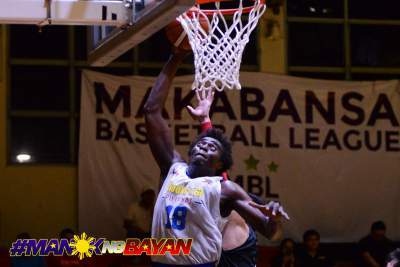 Chooks-to-Go Pilipinas is eyeing Centro Escolar University Congo’s Rodrigue Ebondo as replacement for Bright Akhuetie in the 2017 FIBA Asia Champions Cup. Akhuetie is currently serving his residency with the University of the Philippines, and it was unclear yet if playing for Chooks-to-Go could affect his eligibility to play in UAAP Season 81. "We’re still checking out with Bright because of his eligibility and it might affect his UAAP residence so we brought in Rod Ebondo,” said Coach Chot Reyes, according to Inquirer. Ebondo previously played in the PBA D-League Foundation Cup with the Centro Escolar University team. He is currently playing for CEU as reinforcement in the Universities and Colleges Basketball League (UCBL). The 6-foot-6 Ebondo helped Chooks-to-Go over NLEX-SCTEX in a tune-up game with 26 points at the Meralco Gym on Saturday, September 16. His fellow import Isaiah Austin scored 13 points. The anticipated 2017 FIBA Asia Championship Cup will take place starting September 22-30 in China.